Keto Oatmeal - "No Oats" Low-Carb Porridge Recipe - Warm & Creamy! 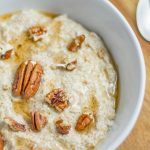 Our Keto Oatmeal Recipe is quick and easy to make, and there's nothing quite like a filling bowl of "Hot Porridge" on a cold morning! Place the dry ingredients into a small saucepan and mix together. Place the saucepan over medium heat and whisk the ingredients together for about 10 minutes until it has thickened and is warmed through. Pour into a bowl and top with your favorite toppings - we recommend extra Sugar-Free Maple Syrup and chopped Pecans.